El Agave in San Diego Old Town is possibly unlike any Mexican restaurant you have ever been to. This is baffling to me. I thought I knew Mexican food. After all, I've lived in San Diego nearly my entire life and have eaten so many tacos and burritos that there should be a sign over my house ("One Billion Eaten So Far"). I also know that San Diego's Old Town borders on tourist trap territory and have been known to cringe when out of town guests insist we dine there the way a San Franciscan must cringe when you force them to eat at Red Lobster or Joe's Crab Shack. I mean, come on, San Diego Old Town is to Mexican food what Donny Osmond is to rock and roll. And then I went to El Agave Restaurant and Tequileria and got my mind blown. Inside El Agave in San Diego. This is Old Town? So let me put this out there for anyone, whether you are a local or tourist, looking for tacos and burritos and mariachi bands. This is not the place. In fact, though it is officially "in" Old Town it has nothing to do with the the festivities down the street. It could be - and probably should be - in a different part of town, maybe even a different country, so that you could avoid comparisons to places like Fred's Mexican Cafe or Casa de Reyes, two of the most popular tourist spots known more for their atmosphere than their food. But here at El Agave, food matters. In fact, food is all that matters here. So let's dive into the chips and salsa. Yes, they still have chips and salsa. This IS a Mexican restaurant, right? Super delicious chips and salsa (El Agave Old Town San Diego). Chips and salsa tell you a lot about the food to come and these chips were light, crispy, without any hint of the heaviness that happens when their cooked in old, used oil. The trio of salsas, which included a nice bean dip, were deep in flavors, rich and complex. So they passed the first test. Excellent chips and salsa. But how about a margarita? Down the street the margaritas are the size of a bird bath and filled with brightly colored frozen ice slushy concoctions. The El Agave house margarita - on the rocks with salt, of course. I always like to try the house margarita. A lot of restaurants in town use a margarita mix, a corn syrupy artificially flavored formula, but El Agave uses fresh ingredients. Tourists beware, it can be a bit more sour than what you might be expecting but to me this margarita was perfect. But wait, how does it compare to a perfect Cadillac margarita? For a few bucks more, upgrade the margarita to a perfect one! Adding a bit of orange and Grand Marnier made the El Agave margarita even better! Without crossing the line to sweetness, the Cadillac margarita might get my vote for best margarita in town, certainly the best in Old Town. I mean, really the BEST in Old Town. If you like margaritas, if you can taste the difference between a fresh margarita and one made with artificially enhanced green goo, then you need to try one of these. So I never do this! But after one of their margaritas this seemed reasonable, even logical and somewhat mandatory. Some of you might not realize this but I am the first guy to take photos of his food starting way back in 1998 when I first launched Local Wally. I tell you this because I have taken a lot of food pics in a lot of great restaurants but this calamari stuffed with shrimp and chorizo is possible one of the most beautiful dishes I have ever seen. I just wanted to stare at it, marvel at the artistry of it, but then I could not resist and I - yes - I ate it! And wow, what a great starter, the calamari cooked perfectly tender, the filling so very flavorful, I felt a little guilty eating something so beautiful but like they say in the Doritos ad, don't worry, they'll make more. And I will come back, just for this along. I have a buddy from North Carolina who went to a Mexican restaurant and wanted to know what a mole tasted like. A mole. Like a blind rodent Mole. Well El Agave specializes in mole (as in "mol-lay") but it's not a creature but a sauce, and a very complex sauce at that. I got mine with pork though you could also go with chicken. Look, don't trust me. I don't know nothing about mole sauce. But trust the people behind me, grown men making yummy sounds like Rachael Ray and saying things like how this is better than momma used to make and how they haven't had anything this authentic in years. Of course they were also ordering shots of tequila so maybe trust me as the rookie who tells you that this trio of mole sauces was, well, yummo. I'm going to hate myself later for saying that. 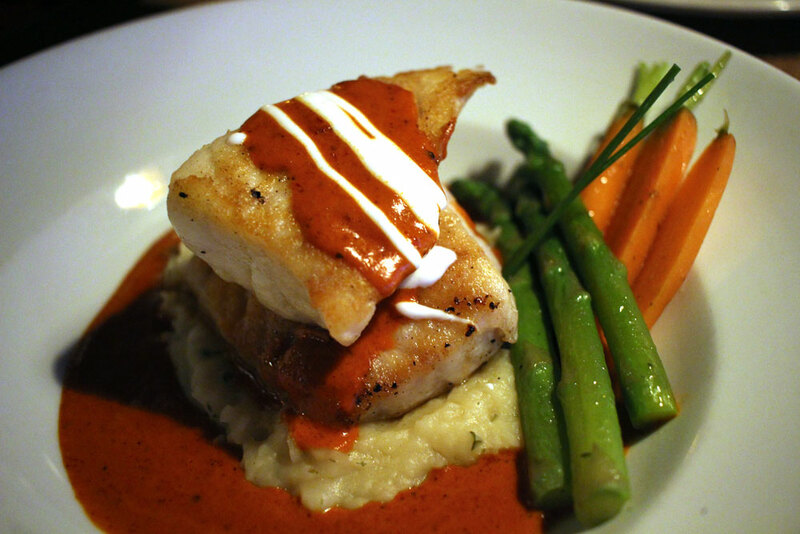 Another beautiful and flavorful dish, this time sea bass from El Agave. Before I was asked one more time by my wife to put the camera away, here is a shot of her sea bass with a garlic chipotle chilli sauce. Let me remind you that this is a Mexican restaurant, this is Old Town, so what the heck is this plate looking like it came from a high end foodie restaurant doing in front of me? And once again, the flavors were spot on, fish deliciously cooked, just amazing. Dessert at El Agave in Old Town San Diego. We ended with a bit of dessert, a creme brulee sort of thing with chocolate flavoring and it was decent, though not quite in the same caliber as the rest of the meal. Next time I would skip the dessert and just walk down the street to get a churro. Look, I like churros! In fact, I'm going to get me one right now! See, I wasn't kidding about the churro! El Agave Mexican Restaurant and Tequileria surprised me. It's not your typical Mexican restaurant, it really falls into the gourmet category, a foodie sort of experience that you don't expect to find in Old Town. Tourists looking for carnitas tacos and carne asada burritos should probably dine elsewhere but if you're looking for a different take on Mexican food, or heck, if you just love food in general, then El Agave doesn't disappoint.